Keyword Research is the foundation of any website. If you choose the wrong keywords a lot of time, effort and money may well be spent for very little return. The concept of keyword research and keyword selection is understandably poorly understood by many business owners who believe that selecting simple terms relating to their service will ensure they are found in the search engines. This is rarely the case as there are many businesses who offer the same service. Its important to work closely with your website developer to ensure the correct terms are selected. Try entering the keyword ‘Plumbing’ into search engine. Google returns 175,000,000 results in just 0.54 seconds. This means that there are 175 million pages referencing ‘Plumbing’ in Google. There are however a number of ways to ensure that your listing appears far higher up the rankings. Keyword selection of long tail keywords optimised for both local and national search make up one element of this important strategy. What are long tailed keywords and how do I choose them? Long tailed keywords or ‘key phrases’ are keywords made up of more than one word. An example of this would be ‘SEO in Cardiff’ or ‘SEO Services in Cardiff’. These long tailed key phrases are searched for less than ‘SEO’ or ‘SEO Services’ but are more specific to the searchers needs and invariably invite less competition. By basing your website or campaign around these long tail key phrases it’s possible to rise above the competition by providing a more specific result when individuals search. In order to choose the most appropriate keywords or key phrases we can help you using tools such as the Google keyword Planner. 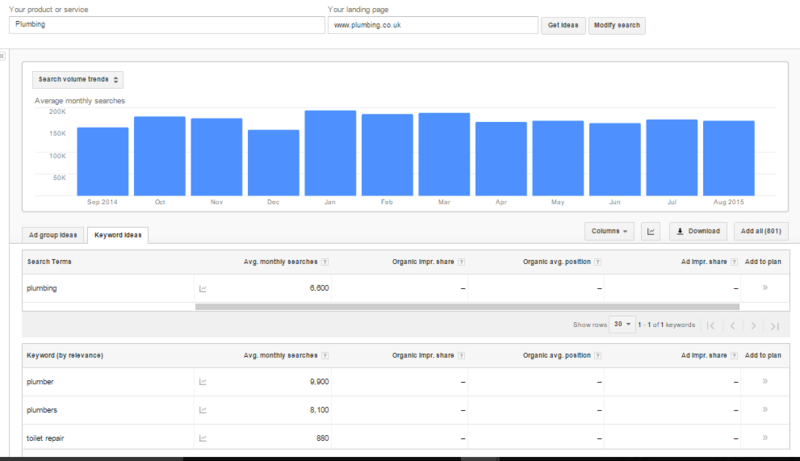 The Google Keyword planner provides accurate information on the number of searches made for a keyword over a given time in a particular geographical area. If used correctly it can also give suggestions of appropriate keywords to use for your service or product. For more information on Keyword Research or a ‘no obligation’ consultation with one of our digital consultants at Red Kite Digital call 02920 530745 or simply complete one of our contact request forms.